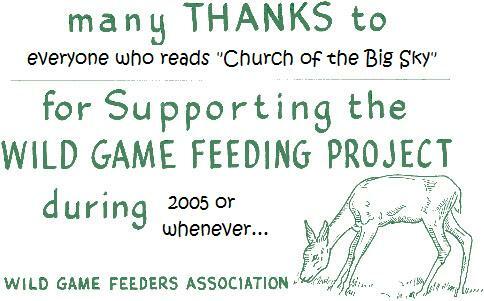 Church of the Big Sky: Thankya very much! I must like you. I actually centered this picture. And mucho thanks to the folks who pass through here and read all this crap. There are only 10 or 11 people who have ever left comments, and I hope they alone don't make up the bulk of the hits on this blog. If that is the case, please, please, please - go outside. It's probably sunny where you are! There is warm weather frolicking to be done!!! I have been a satisfied and loyal reader since May 1, 2005. Please know that I always read, even if I don't post. I remember that I found your blog because you left a clever and articulate comment on somebody else's site. Once having tasted your wit, I became curious and clicked on your User's Name and it linked me here. Eventually, it is my plan to read back through your archived posts, as I have had a hoot of a time reading the newer stuff! I am an observer by nature, so I am naturally drawn to people that have a knack for writing in such a way that it opens little windows in the mind of the reader, letting them see life from a different perspective. We live on opposite sides of a large country and I like the fact that I can effortlessly take a peek at life on the flip side. A wonderfully cheap and vicarious adventure. There is nothing so fascinating to me as experiencing the realities of life, with all it's foibles, through the eyes of another person. I appreciate your creativity and ability to find social commentary in the most simple of places... it truly is an art form.